Flash has been around for many years, and is a major part of the e-learning industry. It is still a feature of the most popular e-learning content tools, even though it has no support from Apple and steadily dwindling support from Google Chrome. The alternative, HTML5, is on the rise. Unlike Flash, HTML5 is able to load on mobile devices including smartphones and tablets. It has grown in maturity, application and support, and will soon match Flash in terms of features and available content creation tools. Even though Flash will still be supported with particular apps and plugins, it is on its way out. Nevertheless, it is difficult to imagine how content tools such as Adobe Captivate or Articulate Storyline will survive into the post-Flash era. Content authoring tool providers are now trying to compensate by converting content elements from Flash to HTML5, but the technologies are inherently too different for this to be a good solution. Articulate is hinting at an exciting development in the near future, so perhaps they are working on solving this problem. 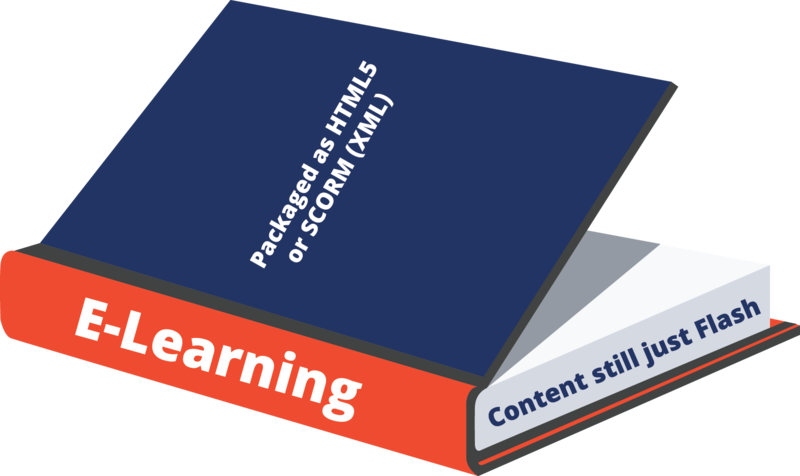 To prepare your e-learning content development processes for a future without Flash, you should accept that the e-learning HTML5 contact tools won’t match Flash content tools for a while yet. It is worthwhile investing in building HTML5 skills in your team, while also investigating which HTML5 tools will best suit your specific needs. Make sure you sensitise your learners to the exit of Flash, including making them aware that they may need specific devices, plugins and apps to render Flash content when it is no longer supported by mainstream technology.